Over the last five years, the global economy has been changing. Consumers are buying more goods online, e-commerce is flourishing, and supply chains are moving at a breakneck speed. At the same time, the number of trade agreements is growing, and countries are increasingly more focused on regulations, supply chain security, and the movement of cargo across their borders. For US Customs and Border Protection (CBP), the effects have been staggering. “Everyone wants everything now. You order something online today; you want it at your home tomorrow,” said Todd Owen, the Executive Assistant Commissioner of CBP’s Office of Field Operations. But with speed and immediacy come logistical challenges. The number of shipments entering the United States (US) by air, rail, truck, and sea is rapidly increasing, especially by air. 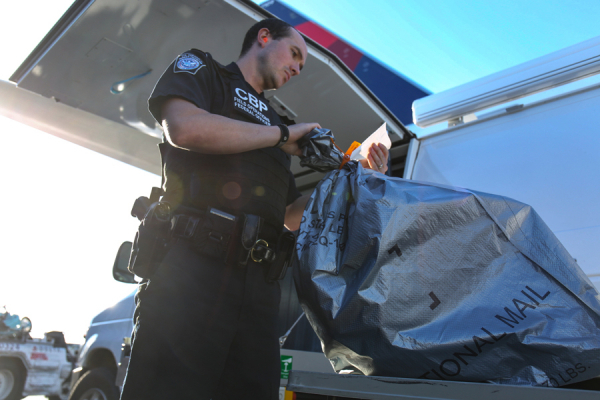 In 2015, CBP inspected more than 275 million parcels at express courier hubs and international mail facilities. As a consequence, over the last few years, the agency has been transforming its processes to increase efficiency, and to make CBP more nimble as a Customs organization so the country would not be left behind. When CBP was formed in 2003 as part of the newly created Department of Homeland Security, it was an outgrowth of the events of 11 September 2001, and its primary focus was protecting the US from terrorism. This was a major shift from the agency’s roots as the US Customs Service. “Our traditional mission of facilitating and enforcing trade was not as strong as it had previously been,” said Brenda Smith, the Executive Assistant Commissioner of CBP’s Office of Trade. © Ya-Huei Laura Lee – A CBP officer inspects a bag of international mail as it arrives at Los Angeles International Airport. © Marcy Mason – Shipments of parcels being inspected at the DHL facility by CBP officers at John F. Kennedy International Airport. But by 2010, things started changing. The worldwide recession; several new trade agreements; and a significant growth in e-commerce, where goods are bought and sold easily over the Internet, prompted CBP to elevate trade. “We took a look at the strategic gaps in how we were conducting our trade mission,” said Smith, a chief architect of the transformational plans. A major sticking point was paper. “Our trade processes were very cumbersome because everything was done with paper,” said Smith. But it was much more than that. “It’s not just getting rid of the paper. It’s actually using the information in those documents to make decisions. We didn’t have the visibility or the tools to do that,” said Smith. CBP identified significant gaps in other areas. For example, importers were not viewed as accounts. “We were still at the transaction level,” said Smith. “Every time we dealt with a company, even if the company had an excellent track record and we had dealt with them many times before, we looked at the company as if we had no idea who they were. It was slowing us down, and when we made our decisions about the risk of a particular transaction, we didn’t consider all of the other information that we knew about the company. So importers couldn’t bring their goods into the US quickly. We were holding their goods, trying to decide if they were safe to let into the country,” she said. Automation was at the heart of CBP’s transformation efforts. “So much of what we do is driven by data, it’s essential that our trade processes are automated,” said Smith. The agency began automating its cargo processing system during the early 1980s, when the legacy US Customs Service built the Automated Commercial System. Significant progress was made, and in 1993, the Customs Modernization Act was passed, which gave legal authority to develop the next generation of automation. Starting in the mid-1990s, plans were made for a new cargo processing system, the Automated Commercial Environment (ACE). ACE was intended to help the US government collect duties, analyse and assign risk, and process international shipments coming into and going out of the country. Another area that CBP tackled was simplifying processes, which has been a welcome relief for many importers and exporters. “There’s an increasing complexity in global trade,” said Alexandra Latham, the Director of Customs Compliance at Costco Wholesale Corporation, an American membership-based retailer with warehouse stores in nine countries around the world. “When we purchase goods, they need to meet the regulatory requirements for all nine countries that Costco is doing business with.” But as Latham pointed out, it is costly. “The increased complexity in requirements makes it prohibitive for a business to continue to import goods. It drives up the cost for consumers,” she said. 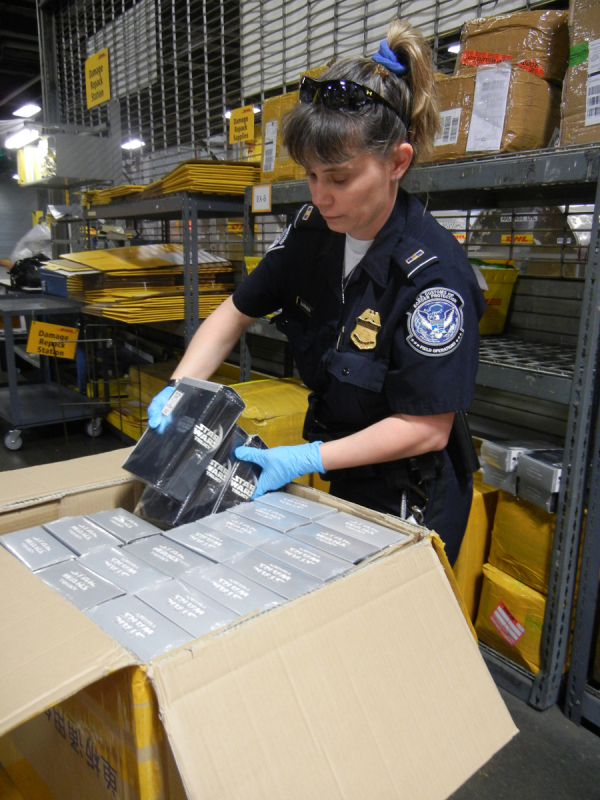 In 2011, CBP introduced the Centers of Excellence and Expertise, a sweeping, transformational change in how CBP worked with the trade community. Operating on a national scale, the Centers became the primary point of processing for importers within a specific industry. Today, there are 10 Centers, focusing on a range of industries including electronics, pharmaceuticals, automotive, petroleum, consumer products, apparel, and others. Staffed by experts who are linked virtually across the country, the Centers are based at locations strategic to the industries they serve. The idea for the Centers was one of several suggestions proposed to CBP in a 2009 paper written by the congressionally mandated trade advisory committee, known as COAC. Most of the paper’s suggestions centred on a ‘management by account’ concept, which viewed companies as accounts rather than on a transaction-by-transaction basis, where each shipment was reviewed separately. The trade community believed that the account managed process would help products enter the country more quickly, and that there would be more predictability on when merchandise would be on store shelves. One of the Centers’ goals was consistency. “The lack of uniformity at the ports has been a huge complaint of the trade community,” said Bray. “We’ve had shipments that come in through a port and a Customs officer there will ask us a question. Then a week later, a different Customs officer at a different port will ask the same question. No one has time to answer the same question over and over again at different ports. It’s burdensome, and it’s costly for any business to duplicate its efforts,” she said. Satisfying requirements for the multitude of regulating agencies is a major hurdle. “Even if CBP would say, ‘Your shipment looks good,’ one of 47 agencies with regulatory responsibilities could stop the shipment and tell us, ‘You can’t bring this into the country,’” said Bray. The underlying problem is a lack of unity. “We see the inconsistencies across government agencies because we work with different cargo processing systems. Some still use paper and faxes,” said Ted Sherman, Senior Director of Global Trade Services at Target, one of the largest mass merchandizing retailers in the US, and importers of containerized freight. The support came through in February 2014, when President Obama signed an Executive Order to streamline the US import/export process, creating a single window (SW) for businesses to electronically transmit the data required by the US government to import or export cargo. The new system would speed up exports of American-made goods, so that the US could compete more effectively in the world marketplace. Completion of the SW system was set for December 2016 when the Obama administration ended. In March 2014, CBP Commissioner R. Gil Kerlikowske took over the reins of the agency. He understood President Obama’s vision, and within weeks reached out to industry to listen to their concerns. At the top of the list were worries about how other government agencies were going to implement the SW. The trade community was concerned that the agencies might start asking for more information. They also had concerns about how the timing of the new system would impact their supply chains and the economy. Furthermore, they questioned whether the system would be useful, and fit in with their operations. Exports were another key area of focus. In 2010, shortly after President Obama launched a National Export Initiative to revitalize and promote American exports abroad, CBP asked COAC to help the agency improve the country’s export process. From an industry perspective, members of the trade advisory committee mapped out the obstacles to a smooth, flowing process. Eighty were identified. For security purposes, the US Department of State regulates and issues licences for military-related shipments sent overseas. “Depending upon the licence type, we have to get paper documents signed by CBP before we can import and export shipments,” said Parks. “This can become very problematic and time-consuming in terms of logistics. For example, we’ve shipped cargo out of the port of Los Angeles, and then brought the shipments back through the port of Phoenix because it made logistical sense. The paper licence needed to travel between the two locations before the shipments were signed-off. This is probably the biggest pain point in our industry,” said Parks. © Fiat Chrysler Automobiles – New Jeep Wrangler vehicles for export out of the US are loaded onto railway cars at the Fiat Chrysler Automobiles’ assembly complex in Toledo, Ohio. CBP is also updating some initiatives. The Customs-Trade Partnership Against Terrorism (C-TPAT) programme is one of them. Launched in the wake of 11 September, C-TPAT was created in partnership with seven major companies to ensure that America’s supply chains are secure. Internationally, the programme has had a significant impact, providing the world with supply chain security protocols. It also is the prototype for an “authorized economic operator (AEO),” or trusted trader programme that voluntarily works with corporate citizens to help ensure the highest degree of supply chain security. Today, nearly 12,000 companies participate in C-TPAT voluntarily. Those who participate in the programme are considered low-risk and enjoy fast-track privileges at the US’s border crossings and ports. In return, companies which are certified by CBP must agree to enforce security throughout their supplier networks, provide a profile on the security measures their companies have in place, and undergo a risk assessment by CBP.